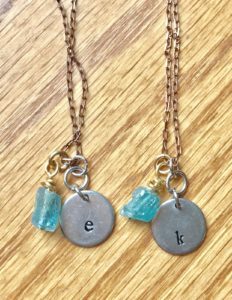 For the bridesmaids, consider some pampering or personalized gifts. 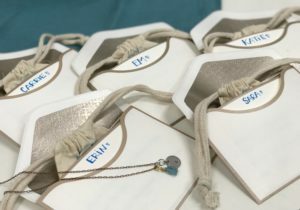 I gave my bridemaids a monogramed necklace with a gem that matched the wedding colors and little bottles of bubbly and orange juice to enjoy while getting ready. I still see some of them wearing the necklace around even though the festivites have ended! Sometimes an experience can be better than a gift. 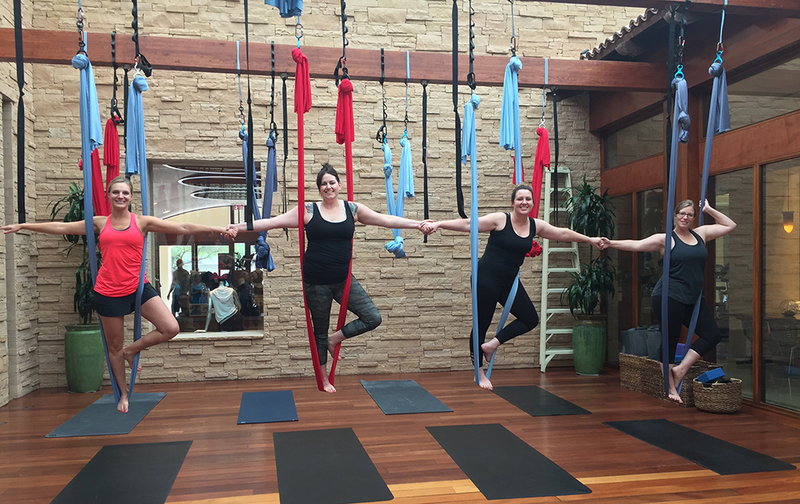 Treat your girls to a manicure with mimomas and breakfast the morning of your big day or some pre-wedding yoga.The key to a great gift for your besties is to make them feel loved. It may seem like there are fewer options when it comes to gifts for the groomsmen. So you have to get creative. Consider giving your guys some fun socks to rock with their ensemble. It won’t distract from your uniformed look in your matching suits and the hidden pop of color or cool patterns will surely give them all something to be excited about. 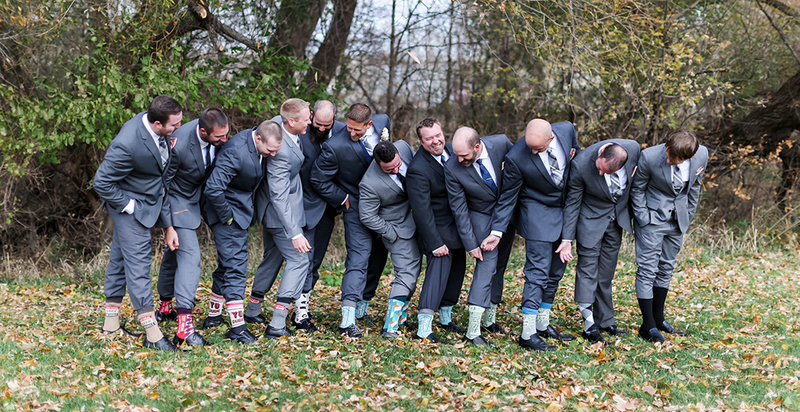 Hitch carries hilarious socks and other fun gift ideas like a “groomsman survival kit” to make sure all of your men look and feel their best on your big day. Hitch Studio is located at 414 Main Ave. in downtown Brookings, South Dakota, if you’re interested in seeing all of our gift options! What about monogrammed coolers, insulated YETI mugs, pop-up lawn chairs, or anything else that really ties your personality into why you chose each of them to stand up for you on your wedding day! Love the outdoors? Fishing? Bowling? Make it personal. What better way to say thank you than with a written word? Hitch has many beautiful and unique thank you cards in our inventory. Looking for something a little more personal? Customizing a card may be just the thing to show your wedding party how much you appreciate them. 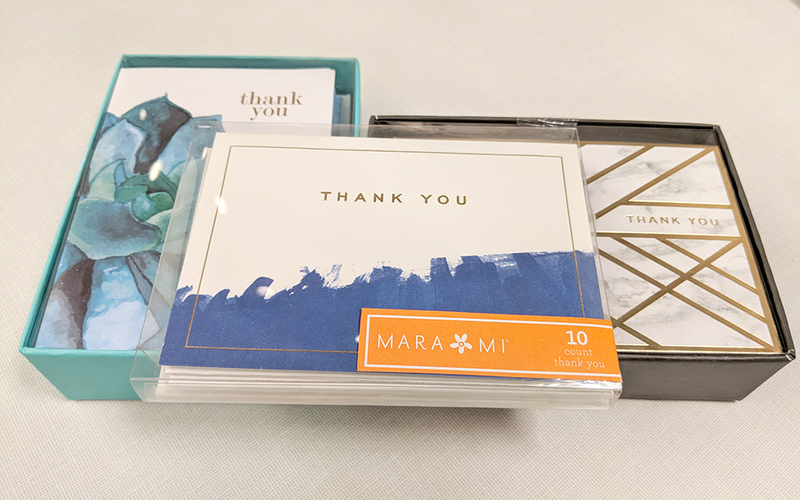 Our designers can create custom thank you’s that will show your loved ones just how much you appreciate them. Get your favorite pictures of you and the people in the wedding party and pair them with individual and personalized handwritten notes. Although summer is coming to a close, that doesn’t mean the sun is going anywhere anytime soon. Sunglasses are a fun way to make all of your wedding party feel even more a part of the party! Warby Parker offers a bulk ordering option for sunglasses that can make the process quick and painless. Consider getting quality frames that can be used long after your wedding is over. Not only that, but nice frames can make a great accessory for fun wedding party pictures on your big day. At my wedding, we gifted every member of the wedding party (readers, bridal party, parents, etc.) with a gift bag full of items from our hometown. 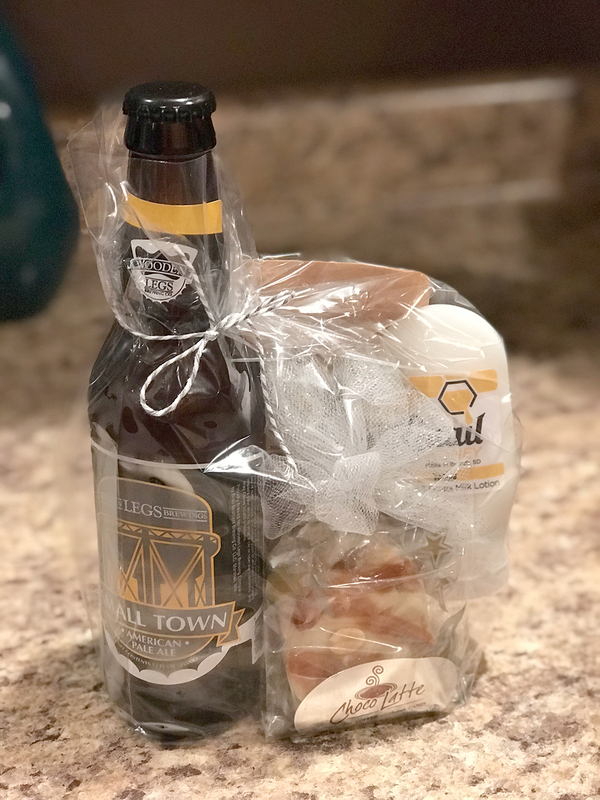 It had our hometown brewed beer from Wooden Legs in Brookings, SD, lotion made from honey in a nearby community, fudge, chocolate-covered coffee beans from our favorite coffee shop and more — all personal to the location of our wedding. People loved it! At the end of the day, it’s an honor to be asked to be in someone’s wedding, but it’s also a pretty selfless time commitment. No matter how you do it, make sure you appreciate the people standing by your side. Need more ideas for how to thank your wedding party? Ask Hitch Studio to create a custom monogram or help in any way!